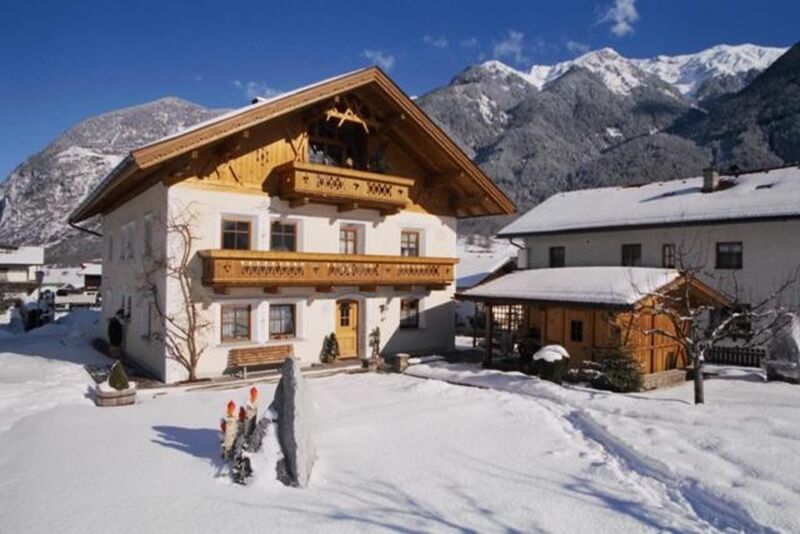 Spend an unforgettable holiday in the familiar house HUBERTA amidst the Ötztal mountains, awarded 4 edelweiss. Who shows up at us, immersed in traditional cosiness Ötztal. No intrusive friendliness, but genuine hospitality. The apartment exclusively with solid wood furniture, parquet. Tile floors is equipped exudes a cozy and warm atmosphere. Bed and table linen and towels are provided. -Tirols Stuibenfall larger waterfall: The Stuibenfall in Obergurgl is an impressive natural experience. The interested observer offers a memorable and impressive natural spectacle. The Stuibenfall is considered the largest and most beautiful waterfall in the Tyrol. 159 m is the mass of water rush raging and roaring in the deep. Recently, a total of five platforms were built on Stuibenfall in various sections, from which the waterfall can be experienced first hand. Especially on the top platform of the visitors to 'You and You' with the Stuibenfall. From May to October every Wednesday Tyrol's largest and most powerful waterfall illuminated after dark! On these days, there is also the possibility of guided lantern walks participate. Recently, runs along the waterfall a medium difficult trail, which was set up by the Ötztal mountain guides in the spring of 2008. Experience the beauty of the Ötztal up close. Since our house is a partner of the Ötztal Nature Park. Can you attend all guided walks and events of the Ötztal Valley Nature Park free of charge. Nature Park "is a predicate with the Tyrolean Government distinguishes areas that are particularly suitable high naturalistic appeal and for the recovery and transfer of knowledge. Cross-country skiing, sledding, winter hiking: Our site offers both trails for beginners as well as seasoned runners, for skaters as well as for classic skiing, for athletes and for nature lovers. In addition to moderate trails and high altitude trails at night about 1 500 m, the area, in addition to the impressive panorama, cross-country skiing trails 1-22 km in length. Experience nature at the Tyrolean relaxed laps through the valley or bring your stamina in the clear mountain air to a new high. The trails are groomed and each consuming your ability or your needs. Sledding is a wonderful activity for families, young people or older people. Whether with a shuttle taxi or after a hard march: a toboggan ride is always a pleasure. In the Ötztal you can choose from a wide variety of toboggan runs. In most cases, can the toboggan trip with a cozy retreat in a cottage or an inn combine. The apartment is u exclusively with solid wood furniture, parquet. Tiled floors and exudes a cozy and warm atmosphere. The apartment has a separate entrance, Entrance hall with cloakroom, Large eat-in kitchen (dishwasher, 4 burner stove, oven, microwave, coffee machine JURA) 2 separate bedrooms for 2-3 people, including a room with a sink and satellite TV, furniture safe large bathroom shower-WC (shower, washing machine, hairdryer, cosmetic mirror) SAT TV, radio in the kitchen The balcony is ideal in the morning to have breakfast at sunrise, or for cozy evenings. The large garden with lawn, patio garden and house. Barbecue is of course also available. Bed and table linen and towels are provided free bread service Own Internet In addition, you will also find a welcome gift. Sehr saubere und landestypisch eingerichtete Ferienwohnung. Hier bleibt kein Wunsch offen. Alles dabei von vollautomatischer Kaffeezubereitung, Waschmaschine und top eingerichtetem Badezimmer . Auch in der großen Wohnküche ist alles vorhanden, was man für einen gelungenen Urlaub braucht. Bücher über Wanderrouten im Ötztal, Spiele für Kinder und Wissenswertes über Flora und Fauna ...bestens ausgestattet. Die Vermieterin ist sehr sehr nett und immer hilfsbereit, eine tolle Überraschung war der kulinarische Willkommensgruß und auch die leckere selbstgemachte Marmelade, die eines Morgens bei den Brötchen lag rundeten einen wunderschönen Urlaub ab. Der Brötchendienst:GENIAL!!!! Toll war auch die Mitgliedschaft der Vermieterin im Naturpark Ötztal über den man kostenfrei geführte Wanderungen und Vorträge buchen konnte. Auch eine Vergünstigung im Ötzi-Dorf war mit dabei. Alles in allem: Absolut empfehlenswert!!! Appartement Hubert hat uns sehr gut gefallen, ein ordentliches Zuhause. Frau Huberta ist nett und sehr aufmerksam, wir wurden gerne wiederkommen. Der Aufenthalt in Umhausen war wirklich sehr schön. Die Wohnung hat uns sehr gut gefallen. Die Küche ist sehr gut ausgestattet und das Badezimmer sehr modern. Huberta hat uns jeden Morgen mit frischen Brötchen versorgt und auch sonst bei Fragen stets ausgeholfen. In unmittelbarer Nähe gab eine Bushaltestelle. Von dort aus wurden wir (mehr oder weniger schnell) in die Skigebiete der Gegend gebracht. Das Gute an den Fahrten nach Sölden und Hoch-/Obergurgl war, dass wir mit als erste eingestiegen sind und so die ca 45 minüte Fahrt sitzen konnten. Wir waren zu fünft (ein baby) im appartement. Es ist gross, reichlich ausgestattet, sauber und gemütlich. Es hat eine gute Lage im Dorf und zwisschen schöne Skigebiete. Eine sehr schöne Unterkunft. Die Vermieterin ist sehr freundlich und umsichtig. Die Unterkunft ist sehr schön gelegen. Man kann von dort aus die Region sehr gut erkunden. Eine sehr ansprechende Unterkunft mit einer sehr persönlichen Gastgeberin. Hier kann man sich von A bis Z erholen! Die Ferienwohnung bietet alles, was man im Urlaub so braucht, die Lage im Ötztal ist vorzüglich und zudem findet man auch Ruhe zur Erholung. Umhausen is the oldest settlement in the Ötztal. Our place is a resting place for those looking for recreation, but also the starting point for many sporting activities. Be it hiking in the summer on pastures and huts or the ascent of mighty giants. Special features: natural lake, Ötzi village, bird of prey park or the Stuibenfall our mightiest and highest waterfall in Tyrol. The newly created platforms and the via ferrata directly on the water allow you to experience the mighty spectacle of the waterfall very close..The free ski bus will take you in winter to the ski areas Hochötz, Sölden and Obergurgl- Hochgurgl. For those who want to take it easy, can enjoy sledding, cross-country skiing, winter hiking or a dreamy sleigh ride through the winter Bracht the beautiful landscape and tranquility. For families Ötz-Hochötz offers. While the children learn their first turns on the slopes through our qualified ski instructors, the parents can relax and enjoy the unique mountain panorama and the perfect powder snow in sight. All this makes the family vacation an unforgettable experience. The Ötztal offers every winter sports enthusiast - whether beginner or old hand - the ideal conditions for a skiing holiday in the magnificent panorama of the Ötztal Alps. Die Preise verstehen sich exkl. Ortstaxe und Endreinigung Ortstaxe: Winter: 3,00 € und Sommer 2,50 € pro Person und Nacht Für Kinder unter 15 Jahren ist sie nicht zu entrichten. Für die Endreinigung wird pro Person und Aufenthalt 20,00 € verrechnet. Kinderermäßigung: 0-3 Jahre 100% Bei Kurzaufenthalten unter 4 Nächten berechnen wir € 2,00 pro Person/Tag zusätzlich. Wir weisen auf die AGBH’s (österreichische Hotelvertragsbedingungen) hin.